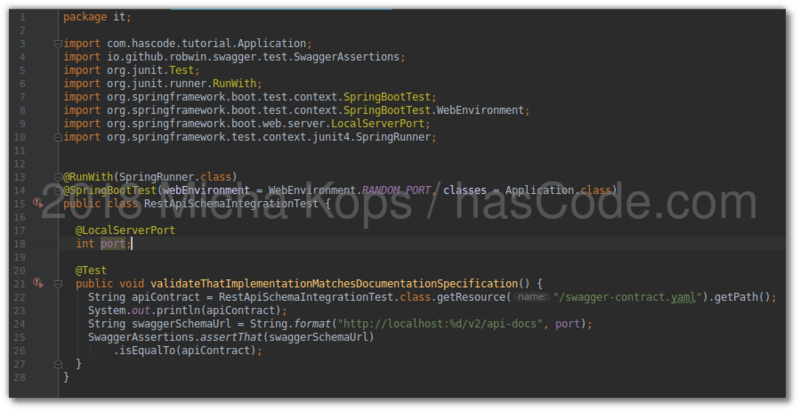 To demonstrate a typical use-case for assertj-swagger I will re-use the Sprint Boot application from my tutorial “Integrating Swagger into a Spring Boot RESTful Webservice with Springfox” because it exposes a RESTful webservice as well as its service-contract as a Swagger schema. So we will write an integration test runnable with Maven that verifies that the exposed service-contract matches a local specification read from a Swagger YAML file. For more detailed information about the OpenAPI specifications, please feel free to visit the OpenAPI Initiative’s web-site or the OpenApi Specification GitHub repository. This is an excerpt from our local contract file in the YAML notation (JSON should be working, too). This is our integration test. It has some Spring Boot specials so that the full web context is started and a random port is assigned for the web application. The relevant part happens inside the @Test annotated test method. This entry was posted on Friday, August 31st, 2018 at 7:50 pm	and is filed under Java, Web Services, testing. You can follow any responses to this entry through the RSS 2.0 feed. You can skip to the end and leave a response. Pinging is currently not allowed.